Mediterranean, DASH, or Alkaline Diet for Gout? Mediterranean, DASH, or Alkaline Diet for Gout? explains how Mediterranean, Alkaline, and DASH diets help gout sufferers. In particular, gout sufferers need easy ways to measure progress towards their goals. Also, I ask which of these diets will help you most. I wrote Mediterranean, DASH, or Alkaline Diet for Gout for GoutPal Foodies. Gout Foodies are gout sufferers who believe food changes can help their gout. But, unlike GoutPal Dieters, they have no healthy eating plan on which to build an effective gout diet. So, this article helps Gout Foodies from step 4 of their GoutPal management plan. Where they test the healthiness of their existing diet. Then, measure progress towards diet targets. Therefore, GoutPal Foodies should continue to read below. 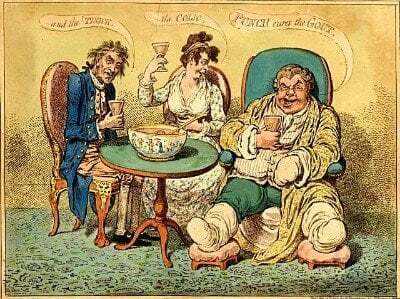 But, if you are not sure which type of gout sufferer you are, please read Questions for Gout Sufferers. Don’t change too much at once. When starting a new lifestyle, try to avoid changing too much at once. Slow changes lead to success. Break goals into smaller, simpler steps, each of which is attainable. So, I believe GoutPal Foodies should consider a gradual introduction of the DASH Diet. Then, they can improve further by introducing Mediterranean eating styles. Or, focus on alkaline diet for gout. But, I think it will be best if Gout Foodies have an easy way to measure progress through their gout management plan. Now, before I ask you which is best for you, I will summarize recent research. The DASH diet lowered SUA, and this effect was greater among participants with hyperuricemia. SUA = Serum Uric Acid, i.e. the uric acid level in your blood. More recent research has developed a simple food scoring method that measures how you are progressing with DASH diet. So, I believe it is possible to tweak this for gout sufferers. Then you will be able to measure the progress of your DASH diet for gout. While reviewing the latest DASH diet information, I checked my earlier advice about Mediterranean eating styles. Then, I found a small study showed that Mediterranean diet could achieve a 20% reduction in uric acid. The average reduction was from just over 9mg/dL to just under 6.5mg/dL. Similarly, recent research has refined a scoring method for Mediterranean diets. So, I believe MedDietScore can be tweaked to give GoutPal Foodies a second way to measure progress towards their goals. urine alkalization achieved through consumption of vegetable-fruit food […] might be responsible for lowering of Serum Uric Acid through its augmented excretion. So, evidence to support alkaline diet for gout grows. But, we still have the problem that calculating PRAL for every food item is very tedious. However, I am confident that new research supports the view that PRAL can be simplified. In particular, since protein is valuable to gout sufferers, I believe a Pro/PRAL scoring system will benefit Gout Foodies. Then, they can balance helpful protein with acceptable PRAL scores. Now, we have scoring systems for each of these diets. But, each of them needs tweaking for gout sufferers. So, I intend to publish diet scoring calculators that can compare how close you are to healthy eating for gout. However, I’m leaving the decision up to you, about where I start. Which healthy eating plan is best for your gout? Your Choice Diet for Gout? You’ve learned there are three choices of foundation diet for GoutPal Foodies. So, please tell me which is your choice in this short survey. If you want to give me more information about yourself, please also complete the Feedback Form, below. Select one of the diets that will help you manage gout. You can only choose one now. But, if you change your mind, you can vote again tomorrow. But, if you are uncertain which is best for you, please ask for advice in the gout forum. If you know which is the best healthy eating plan for you, I can help you manage it properly. So, start your personal gout diary now. Then, I can find out enough about you to guide you through your gout food choices step-by-step. The Dietary Approaches to Stop Hypertension (DASH) diet, Western diet, and risk of gout in men. Hyon K Choi and colleagues. BMJ 2017;357:j1794. and Blood Institute website May 14, 2017. Effects of the Dietary Approaches To Stop Hypertension (DASH) Diet and Sodium Intake on Serum Uric Acid. Juraschek SP, Gelber AC, Choi HK, Appel LJ, Miller ER 3rd. Arthritis Rheumatol. 2016 Aug 14. doi: 10.1002/art.39813. Effects of the Dietary Approaches to Stop Hypertension (DASH) Diet on Serum Uric Acid Levels. Lu N, Zhang Y, Rai SK, Curhan GC, Choi HK. Arthritis Rheumatol. 2015; 67 (suppl 10). Mediterranean diet intervention for patients with hyperuricemia. Chatzipavlou M, Magiorkinis G, Koutsogeorgopoulou L, Kassimos D. Rheumatol Int. 2014 Jun;34(6):759-62. doi: 10.1007/s00296-013-2690-7. Cross-sectional analysis of nutrition and serum uric acid in two Caucasian cohorts: the AusDiab Study and the Tromsø study. Svetlana N Zykova, Hilde M Storhaug, Ingrid Toft, Steven J Chadban, Trond G Jenssen, and Sarah L White. Nutr J. 2015; 14: 49. Published 2015 May 14. doi:10.1186/s12937-015-0032-1.